This month is about to close and Pylon Network team has been very busy on all fronts: commercialization, technical development and a series of attendances to energy conferences and trade fairs! 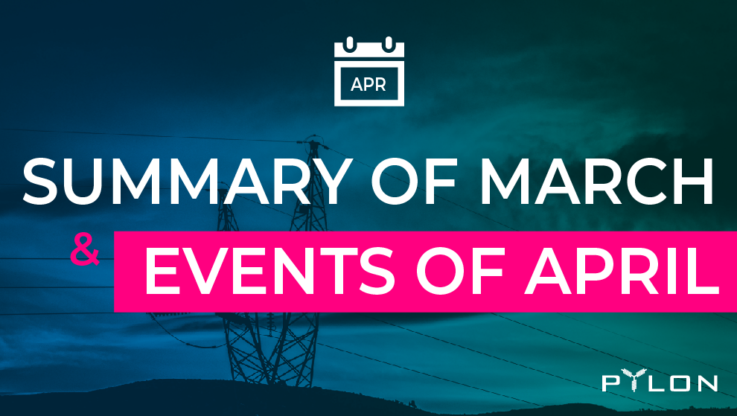 This post will take you through the past month achievements and news, but also offer you an outlook for April. What is coming up for Pylon Network during the next month? Make sure to get prepared since this will be a busy and exciting month – have a look below! After our announcement at the end of last month, all the Beta Test programs are underway: PYLNC / PYLNT wallet, Federated Nodes and Pyloncoin code. The response from the community has been very warm and the testers have given us very valuable feedback and proposals, showing a great degree of engagement with the project – something we are delighted about: one more proof that together we are stronger! Big thank you to everyone who is becoming part of this project, by offering their help and time! Within the next 15-20 days we will be gradually closing the testing pools (starting from Pool #1, followed by Pool #2), followed by a period during which our dev team will be turning the feedback into reality and fixing any errors that have been reported. Please note that the beta test for Pyloncoin code (Pool #3) will be running for a longer period – extended, at least, until the official launch of MainNet. If you have the skills and – more importantly – the energy and motivation to help us identify any potential errors/bugs in Pylon Network’s algorithm, you can find more information here. You are also more than welcome to contact us directly (see contact details at the bottom of the post). Pylon Network team has been on the road, attending a number of conferences and meetings all around Spain. Couple of weeks ago, we published a summary with the takeaways from the two events, which you can find here. Finally, we look back to the opinion article from our CEO Gerard Bel explaining the importance of data neutrality in the energy future and the role that Pylon Network is designed to play: a shared, neutral energy database for instigating cooperation in the energy sector. Two more energy conferences, with Pylon Network’s presence, are coming up in April: on the same day, but different places. With the end of March being just around the corner, we are getting ready for the second Quarter of 2019 – and we are looking forward to. With many developments and exciting news coming up, the updated version of our roadmap will soon be published (more info will follow), offering the outlook and milestones for the coming months. You will have to stay patient until the release of our new roadmap to find out more. Information regarding the updated roadmap and its release, will be coming soon. Stay updated – Follow Pylon Network! In the meantime, make sure to follow us on social media for staying up-to-date with all the news and progress of Pylon Network! Join us on Telegram and talk directly with the team!